THE NEW HIGGINS HAS LANDED! One man with the key to Armageddon. One chance for Sean Dillon to find him. The hunt is on, in the mesmerizing new Sean Dillon thriller of murder, terrorism and revenge from the Sunday Times bestselling author. When an eminent Iranian scientist makes a startling breakthrough in nuclear weapons research he knows that any regime, including his own, will use it to achieve global supremacy. Desperate, he is left with only one course of action. When a ghost from her past reaches out to Afghan war hero Sara Gideon, newest member of the 'Prime Minister's private army', she knows they must risk everything to avoid apocalypse. Led by Sean Dillon, they are plunged into the white-hot crucible of the Middle East and North African terror networks and soon become caught between Iran's secret service and al Qaeda agents in a desperate battle for the ultimate prize. But nothing is ever as it seems in the death trade, and as the operation spins out, from Paris and Syria to Iran and the Saudi Arabian desert, blood will be spilled on all sides as events spiral towards a shocking conclusion. 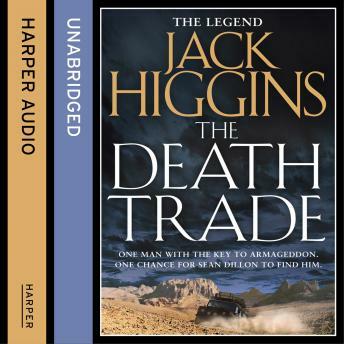 The explosive new thriller from the legendary Sunday Times bestselling author, Jack Higgins.